Can I hook a million motors to this board? Well, I would have to admit that a million motors would be a little bit too much. Actually, about 999,999 too many. No! The AE-MDL-MegaMotor II is not a board to connect a gazillion motors into, but a board to connect different motors as depending on which driver is populated into the module. And that is because the new family of DRV88xx devices, namely the DRV8802/12/13/14/24/25/41/43 devices have the exact same pinout but pack completely different functionality. For example, the DRV8802 and DRV8814 are dual DC motor drivers whereas the DRV8812 and DRV8813 are dual H Bridges intended to control 1 bipolar stepper. By offering independent current control engines, an “infinite” number of microsteps can be put into place by modulating their respective analog inputs. I will detail this technique in a separate article. At the same time, the DRV8824 and DRV8825 are as well capable of controlling a bipolar stepper motor, except that its easy of use is considerably larger than when compared to the prior. This is because ’24 and ’25 have an internal indexer which takes care of all the intricacies of current regulation to achieve microstepping. What you get is a self contained microstepping engine with up to 32 degrees of microstepping and all you need to do is pulse an input to see the motor go. So what about the DRV8841 and DRV8843? These are also dual H Bridges like the ’02, ’12, ’13 and ’14, but with a difference interface. While the ’02, ’12, ’13 and ’14 have a PHASE / ENABLE interface, the ’41 and ’43 have an IN1 and IN2 interface. They both have their disadvantages and advantages. For example, the PHASE / ENABLE interface is very easy to implement, but controls the entire H Bridge at once, whereas the IN1 and IN2 interface divides the H Bridge into two independent half H Bridges. Why would I need this feature? Well, because for instance now you would be able to drive two solenoids! What is the Mega Motor II Board then? An AE-MDL-MegaMotor II module ready to rock! 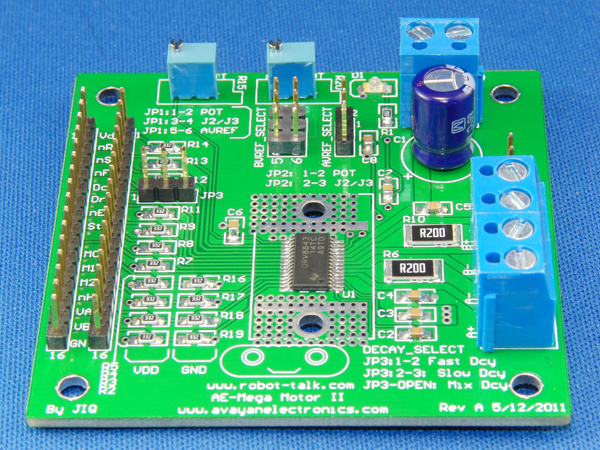 The AE-MDL-Mega Motor II is the second revision of the quite popular AE-MDL-MegaMotor board from Avayan Electronics. What you get is a compact 2.5″ by 2.5″ board with the footprint for a 28 pin HTSSOP package and the pinout of any of the devices we mentioned earlier. The layout was designed to promote low thermal impedance which, if you have been reading this blog, will have lots to do with how much power dissipation can the driver device tolerate. Note that as much as Texas Instruments rates this device to be 2.5A per H Bridge, this parameter is completely useless if we fail to remove the heat. This board is not four layers, which is one of the requirements to allow for low thermal impedance. Instead, three different techniques have been employed which we believe make the design more robust, at the same time preserves a fairly low price tag. To have four layers would only make sense if you are going to produce heinous amounts since the Non Return Engineering (NRE) fees along more than double. Not to mention, each board is then more expensive. So what have we done? First you will notice the same pads we have been allocating on our boards (such as the AE-MDL-STPRE8811) which will allow you to solder a surface mount heat sink. Second, we have massive amount of vias connecting both 2 oz density copper planes together. Third, and for the first time, we have allocated mounting holes which will let the user mount a bottom surface mount. Some of our customers have reported they prefer the bottom heat sinking to the top. We listened! What Other Improvements Can We Expect? As useful as the first revision was, the second revision simply makes it easier to operate the board. Some signals are meant to be either pulled up or down at most times. Pairs of pull up/down resistors have been laid out so that your project can be hardwired with the right signal conventions. We have also routed all the signals into the main header connector. And as expected, you have two headers. You can either use this as an access point to troubleshoot your signals, or as a second port to interconnect two boards together. Believe me, it has worked very nice for some experiments! You still get two potentiometers and all the jumpers to select whether you want to use this analog voltage source, or the one coming from the header connectors. Is up to you! So, Why So Much Flexibility? Well, don’t blame me! The truth of the matter is that having one board to tackle all this possible chips is highly desirable, so why not install all the hooks to make such a board? In some implementations you will use two potentiometers (like when driving two DC motors) while in others you will only use one potentiometer (like when driving a stepper motor). Yet in some implementations you will use no potentiometer (like when driving a motor but specifying the controlling current throughout your own microcontroller DAC. ← Can I drive 10A with the BTN79xx devices on the AE-7960 board? Matt is correct in his statements: both that with a Power Pad device the heat generated inside the device must be released into the outer world by using the PCB as a heat sink, as well that my Mega Motor design (not to mention pretty much any other design) looks like a cheese grater. Although I do not recommend using any of these boards to get your pasta deliciously updated with some parmessan dust (we all know Martha Stewart’s Cheese Grater Supreme does a way better job), do not feel these vias are ill fated. The reasoning behind the “Cheese Grater” effect is to unify the GND plane on both top and bottom layers as to make its resistance smaller. It may look this is necessary for heating purposes, but it is also important for electrical reasons. Since we are pumping so much current, we want the GND impedance to be as small as possible. Why? Well, because we want this current to flow through a path such that no Ground bouncing occurs. Or at least, to reduce the Ground Bouncing effect. Well, all this talk has made me hungry, so anybody up for some Italian?